General chemical applications, oil refining and petrochemical, Pharmaceutical industries. Suitable for use with abrasive clear and corrosive fluids and for cryogenic and high temperature applications. By choosing suitable component material the seals can be adapted to operate with a wide range of liquid and operating conditions. Speed: Up to 6000 RPM according to seal size and working pressure. Wedge sealing member available in PTFE and exfoliated Graphite material. Creates positive seal for use in extreme temperature/chemical. An "O" ring sealing member available in various rubbers. TTV "O" rings and other choices available as per the applications. Lapping process results in high precision finish with optimal flatness. Positive hydraulic balancing permits use in high pressure. Unbalanced design can be used for lower pressure applications, saves cost. The multi-spring designs ensure even face pressure for minimal face wear and compensation for some shaft misalignment. Permits use in all types of rotating equipments such as centrifugal pumps, mixers, and agitators. Reduces inventory requirements. Seals can be repaired easily on site or at any Daybreak's seal repair centers, and/or converted to various seal face combinations. Suitable for use with abrasive contaminated and corrosive fluids, for slurries, sludges and effluents with solid presence. Temperature: -50c° to + 500 c°/-60 F° to 930 F° depending on the material used. Pressure: Type DB-FU-Up to 17 bar g/247 psig, Type DB-FB Up to 62 bar g/900 psig. Wedge or "U" pack sealing member available in PTFE and exfoliated Graphite material. Creates positive seal for use in extreme temperature/chemical. The single coil spring designs ensure the safe pass thru of contamination or solids presence in the process liquid. On clog design which allows the usage of seal in wide range of slurries and sludge type applications. Suitable for use with abrasive contaminated and corrosive fluids and for Slurries, sewage water, viscous liquids. All surfaces contacting the liquid being sealed are made of chemically inert materials. Metallic components are located outside the seal chambers and isolated from the liquid area. Mounted outside of the seal chambers with only the internal surfaces of the bellows and face in contact with the liquid. Maximum corrosion resistance. Eliminates the possibilities of seal face misalignment. Compensates for shaft run-out to promote long life operation. Half clamps secure the bellows tail to the shaft and eliminates galling and premature shaft wear. 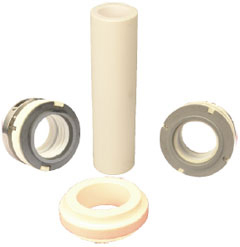 These seals have replaceable seal face insert, so that different face materials can be used to handle wide range of corrosive and abrasive fluids. Suitable for use with abrasive clear and corrosive fluids and for cryogenic and high temperature applications. Most recommended for Vacuum applications. Reverse hydraulic balancing permits use in high vacuum & positive pressure. An"O" ring or "U" pack-sealing member available in TTV, Rubber and Flexible Grphite, creats positive sealing along with the rotating shaft. Typical Duck Bellow made of suitable rubber. The tail end of the duck bellow is held tight to the shaft to form a static sealing joint. 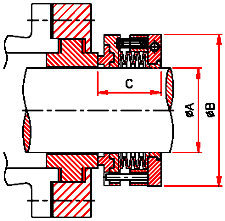 As the seal face wear occurs, the bellow convolution extends the seal face to compensate the wear. Automatic adjustment compensates for abnormal shaft end play, run0out, and primary sealing wear and machinery tolerances leading to improved seal life. 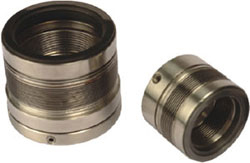 Full convolution elastometric Bellows designed for confined spaces and limited gland depths. Self-aligning feature compensates for shaft end play and run-out. Edge welded Metal bellow seals are constructed by series of stainless steel diaphragm together to from a bellow unit. The bellow unit eliminates the need of springs and provides flexibility to the seal in addition compensates for seal face wear. Provides superior performance in the most difficult process services. Pure and flexible Graphite packing allows seal to be used in extreme temperature conditions. Angle of bellow section is tilted at the inner diameter weld to relive stress concentration and provide longer seal life. Double nested configuration improves flexibility and reduces stresses. Ease of installation with strength. Provides firm grip on the rotating element. Rotating bellows throw off suspended solids that clog the spring type seals. This self-cleaning action eliminates the need of external flushing, filters or cyclone separator and their associated cost.